Mac iPod Transfer, transfer music/ video from iPod to Mac. 3herosoft iPod to Computer Transfer for Mac is the best solution for your iPod to Mac transferring on Mac OS. It allows you to easily transfer Music, Movie, Photo, ePub, PDF, Audiobook, Voice Memo, Podcast and TV Show from iPod to Mac, and freely transfer files from Mac to iPod, even transfer iPod contents to iTunes. And best way to help you easily transfer purchased songs, video, photo, iTunes U, books from iPod touch to Mac/iTunes library. You can also create, edit and delete iPod playlists and copy files among multiple iPods once only. With the Mac iPod Transfer, you will find that quick search, browse, playlist classification and filter tools help you hit what you want as easily as iTunes does. And all types of iPods including iPod classic, iPod nano, iPod nano 5G, iPod nano 6G, iPod touch, iPod touch 4, iPhone and iPad will work well on this program. This best iPod to Mac Transfer can transfer Music, Movie, Photo, ePub, PDF, Audiobook, Voice Memo, Podcast and TV Show from iPod to Mac for backup. Easily transfer Music, Movie, Photo, Podcast and TV Show from Mac to iPod with this Mac iPod Transfer, not need iTunes and more convenient than iTunes. Transfer all music, movie, ePub, pdf, audiobook, voice memo, Podcast and TV Show files from iPod to iTunes on Mac to enrich your iTunes library. Simultaneously manage up to 26 iPods simply by drag-and-drop files among them to share music, movies and photos with folks and friends. All the music, videos and photos can be easily transferred between iPod and iPhone with this Mac iPod/iPhone Transfer. Support all types of iPod/iPhone/iPads including iPod nano, iPod nano 5G, iPod nano 6G, iPod classic, iPod touch, iPod touch 4, iPhone 3, iPhone 4, iPhone 5, iPhone 5S/5C, iPhone 6/6 Plus, iPad, iPad 2, the new iPad, iPad 4, iPad mini. With this Mac iPod Transfer, you can open iPod touch, iPad or iPhone with Finder and manage them as portable hard disc. 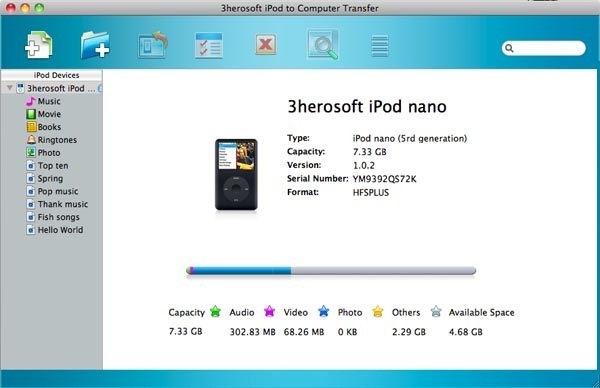 Once you connect iPod/iPhone/iPad to Mac, the interface of 3herosoft Mac iPod Transfer can display you iPod/iPhone/iPad info automatically like model, capacity, version, format and serial number. 3herosoft iPod to Computer Transfer for Mac allows you to create a new playlist to add music, videos and photos for quick access next time. Search movies, music or photos in iPod with Quick Search and Filter by artist, album, genre, composer to get what you prefer. Provide you with two view models: list and thumbnail, that is for your locating and checking files easily and you can also add illustration for music/videos in thumbnails mode. With the highest speed, file transfer between iPod, iTunes and Mac will all be finished in a breeze! Copy and backup iOS iPod files (music/video/photo/books, etc) to Mac computer. How to export iPod touch voice memos to Mac? How to transfer iMessage files from iPod touch to Mac local? Upgrade iPod touch to iOS 5.0 or above, easily allow you to transfer Photo/ePub/PDF files to iPod. How to transfer purchased songs/video/iTunes U/books from iPhone to Mac local? How to transfer music/videos from iPod to iPod on Mac? How to mount iPod as portable USB hard dive on Mac?